Chickens are a good source of protein that can feed an entire family. Chickens are a good source of food that can feed an entire family. They are easy to raise, and the income from raising the animals will be able to provide food, education, and other needs. Imagine the good you can do for a family who often struggles to have a nutritious meal every day. 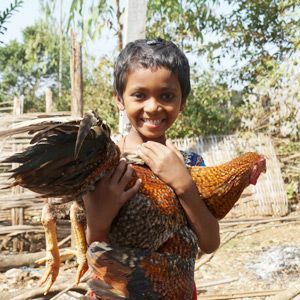 Your gift of $15 will provide a family with 10 chickens. And your small investment will continue to multiply over time. A family will a have flock of chickens before you know it!